My eternal and wonderful grandma has been extremely sick for the last few days, only now leaving the hospital to continue care at a rehabilitation center. Grandma Billington's health has never been superb in her later years. I wondered if I would see her again in this life when I left for my mission to South African 10 years ago. Grandma gave me my nickname, Sundy Lynn Sunshine, which, up until the second grade, I understood to be my given name. I came home from school and told my mom that I was the only person in the second grade class with four initials. Only then did I learn that the Sunshine part was bestowed upon me by my favorite person, Grandma B. As I've watched my own mother become a grandma to Claira (and my mother-in-love, too! 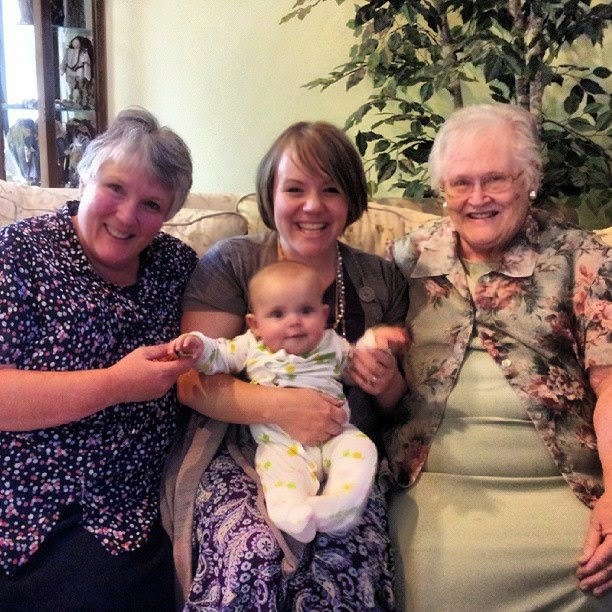 ), I thrill at the prospect of Claira getting her very own "Grandma Billington." My childhood was full of grandma moments--my strongest, brightest memories include her baking, reading, playing with me. I can smell the smell of her basement, her grandma "scent," her famous cookies and desserts--all in an instant I am taken to the golden days of no cares except that I was with Grandma. Grandma made me feel that I was the most important person in her world. These memories have come back in flashes that bring the nostalgia to current tears and gulps of how treasured my relationship is with her. As I was talking to Grandma this morning, she told me that I was good mom. I told her that I had a good mom, who learned from a good mom. That prompted her to say that she had made her mistakes, that we all do, and that we have to remember that we are doing the best we can. I believe that now more than I ever have.So much of my graduate program in counseling focused on figuring out my own hangups during childhood. Indeed, I had several hard conversations with my parents, my mom specifically, about painful wounds on both sides of that relationship. I needed to speak my truth about my experiences about childhood from an adult perspective. I count those conversations with my mom as sacred in my life because whether or not she saw the experiences the same way, she allowed me to speak. I spoke and was released. I'm a mom to Claira now. And we have entered into a new phase of relationship, one where she experiences the world as an independent soul that has an opinion on everything. The day in and out of this experience--being Claira's one and only mother--will surely bring me to my knees, again and again. It already has. I know I am doing the best that I can. Good moms often feel like bad mom because we want to be the perfect, consistent parents that exist in parenting books and blogs. But I can't be that for Claira. I can be me, and I will be enough. And for the days that she will need a consistent sense of unconditional love that never need discipline or say no more candy, she will have Grandma. I love my daughter. I love my mom. I love my grandma. The true sunshine of love will continue through generations of women who do and did the best they know how. It's more than enough.